Posted on December 20, 2017 at 3:48 pm. Posted on December 16, 2017 at 11:19 am. Posted on December 8, 2017 at 8:37 am. Posted on November 29, 2017 at 7:14 am. The AsiaSpa Awards were created by AsiaSpa magazine in 2005 to recognize the leaders in Asia’s dynamic wellness industry. The prestigious accolade sets the benchmark for quality and innovation for spas in the region and celebrates properties and spas that constantly strive to evolve the wellness sector through innovation and excellence. Over the years, the AsiaSpa awards have established its uncompromised independence, transparency and objectivity, plus they are among the most accessible awards, as all spas and resorts in the region are eligible for nomination, regardless of size or ethos. 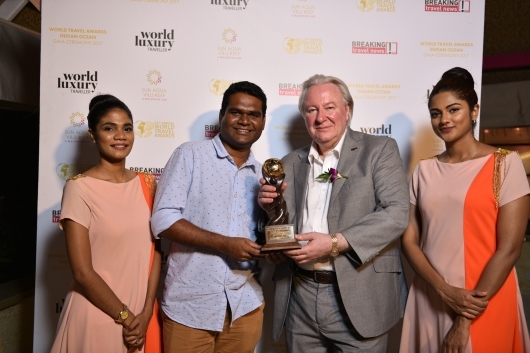 In this ceremony, Six Senses Laamu won the Eco-Spa/Hotel of the Year award that celebrates its commitment to sustainability throughout its operations and development. With many conservation projects and initiatives in place, Six Senses Laamu and its Six Senses Spa have committed to being a leader among Maldives resorts and of the industry by demonstrating such responsible operations, while providing high-quality services and experiences to its guests. In winning this award, the resort has been acknowledged for its pursuit of excellence and for striving to raise the bar in the region’s thriving wellness industry. About Six Senses LaamuSix Senses Laamu is the only resort in the Laamu Atoll, deep in the Indian Ocean, surrounded by a beautiful coral house reef. Most of the villas and facilities are built overwater, however, beach villas and on-land dining is an option. All villas offer a sense of privacy and seclusion, with an amazing view of the Ocean and Maldivian nature. Six Senses Laamu offers a wide range of dining options, with cuisines from around the world, an ice cream parlor, an overwater wine cellar and a signature Chill bar. Many activities, excursions and options are available for everyone to enjoy, both over water and underwater, in addition to the Six Senses Spa. Posted on November 3, 2017 at 8:09 am.